Ezidi people (or Yazidis in English) are a religious group of about half a million people who is native of the northern Iraqi province of Nineveh. They share the same language and much of the culture of the Kurds of Turkey and Syria. Because of their attachment to a cult of Gnostic origin and pre-Islamic they’ve been received years of strong repression. In last two years Yazidis, have been the main targets of ethnic cleansing by IS militiamen, along with Christians and Shiites. Everyone remember their fugue towards the mountains of Sinjar , when IS began a strong offensive in northern Iraq on early August 2014. At that time, IS forces committed a massacre, killing over 5000 Ezides men and kidnapping other thousands of women, sold into slavery in Mosul or Raqqa. The population who survived to the attacks fled in the mountains around Sinjar where it was trapped without food, water or medical care, facing starvation,dehydration and the risk of more incursions by IS for several weeks. Fortunately PKK and YPG Kurdish forces open a corridor towards the mountains to Rojava ( Northern Syria, led by kurdish forces ) in order to make them flee safely. Thousands of Ezidis get safe in Rojava or in Anatolia at that time. 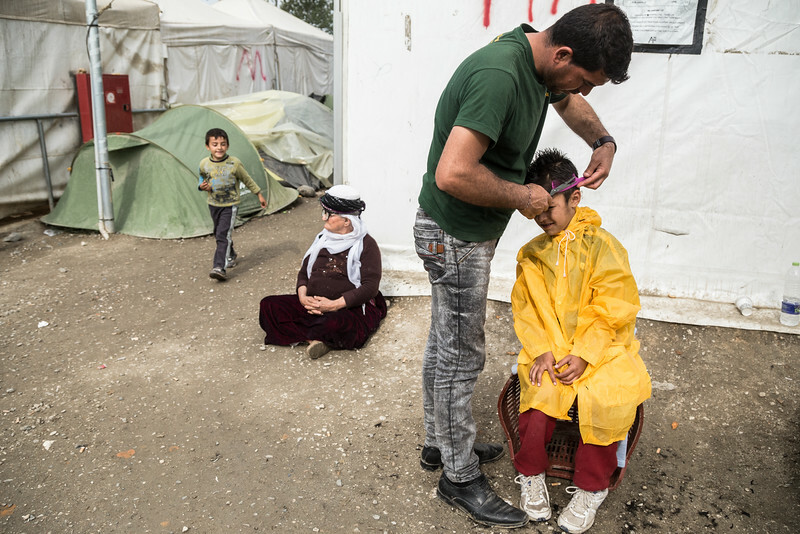 Their pain unfortunately seems to be endless, because as like thousands of people are fleeing from war zones due to unsafe situations, thousands of Ezidis try to escape to safer zones, in Europe, where their tragedy continues. The world finish once again at the gates of Europe in refugee camps like the ones between Greece and Macedonia. Here in these notorious makeshift tents camp surrounded by waste, toxic fumes and mud, there are still over 3000 ezidis that are stuck waiting for the reopening of the border, closed on beginning of March by Republic Of Macedonia's authorities with the silence approval of Europe; the same Europe that at the time of Ezidi's flee in Sinjar mountains was crying for them, now close its eyes in front of them. Despite the removal of the biggest tents camp in Idomeni, Yazidis still are in the area and around Katerini, one hour southern by car.